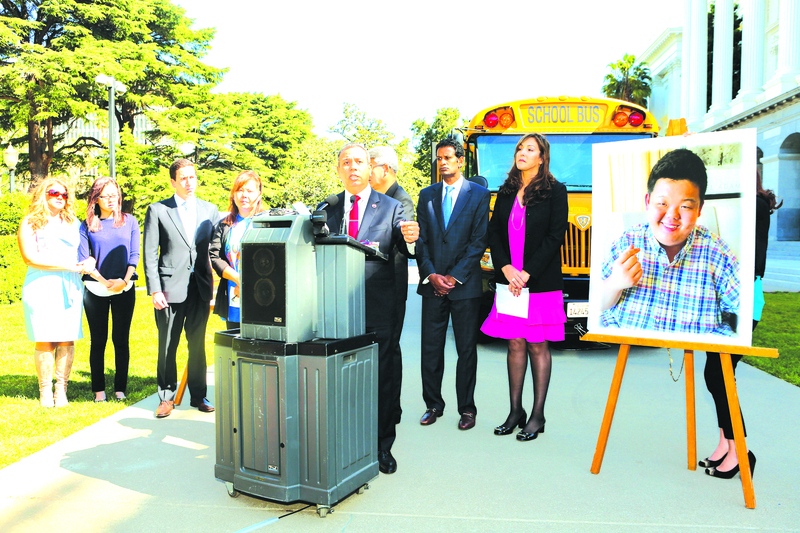 Paul Lee School Bus Safety Law: State Senator Tony Mendoza at a news conference with the Lee family. At right is a picture of Paul Lee who tragically died in the back of a school. The bill/law will require a bus driver to walk to the back of the bus to turn off an alarm to ensure children are not left on the bus. Sacramento – After hearing testimony from the parents of Paul Lee, a special needs student from Whittier, who tragically passed away last year after being left unattended on school bus for many hours, the Senate Transportation and Housing Committee approved SB 1072, authored by Senator Tony Mendoza on a unanimous bipartisan vote of 10 to 0. The bill known as the “Paul Lee School Bus Safety Law” would require school buses in California to be equipped with child-safety alarm systems to ensure that children are not left on buses unattended and in potentially hazardous circumstances. It would also require drivers, upon a renewal of their annual school bus driver safety certificate, to receive training in child-safety check procedures. “The State Council on Developmental Disabilities is proud to Sponsor SB 1072, and we are grateful to Senator Mendoza for carrying this important bill. The tragedy in Whittier was totally avoidable. The state must take decisive action to ensure something like this never occurs again, ” said Dr. April Lopez, Chair of the Council. Add a reporting requirement to ensure that the Department of Motor Vehicles is notified of cases when a child is left on a bus unattended. Direct the CHP to promulgate rules to implement this section and provide a list of child-safety alarms that are approved for use in school busses and a qualified technician or mechanic that can install the system. Grant school districts and school bus contractors a grace period of eight months after the date that the CHP issues the rules to install a child safety alarm system.